GPS navigation devices are easy to use with a screen 5 "display supports both portrait andlandscape. Find restaurants, shops and more, both new and popular with Foursquare®. Do not use cell phone signals And Nags affected area with no cell phone signalis considered. Is equipped with a high-resolution map of the country. The updatedfree lifetime¹. Easily navigate through the complex route. Search for addresses and points of interest easily. GPS navigation is designed specifically for ease of use. For driving directions on the road. Forgot your smart phone and to activate your nüvi into the nüvi 57LM GPS device that is designed specifically to navigate the convenient use. Which does not use a cell phone signal. And is not affected by airless cell nüvi 57LM shaped modern and bright 5.0-inch screen display in portrait or landscape orientation. Comes with mounting brackets to attach firmly to the glass. The detailed maps are updated for free. 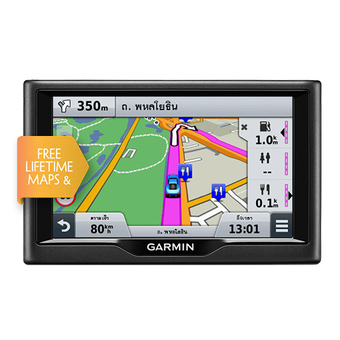 nüvi 57LM comes with preinstalled detailed maps of Thailand.